In this blog I’ve already discussed the last mover advantage and why in many cases arriving late might be a good thing. In this short essay, I want to highlight how this counterintuitive principle applies more and more to the tech world. In the tech industry, the winner of the past might become the biggest loser. Indeed, as an innovative company, in many cases, you take over a sector by disrupting its old logic. For instance, Microsoft had dominated the tech industry, until Google took it over. What happened there? While Microsoft had been able to ride the wave of innovation (or at least of financial consolidation) throughout the 1990s, it also tried to take over the next phase of technological innovation by applying an old logic to whole new technology: the internet. One of the exciting things about the Internet is that anyone with a PC and a modem can publish whatevercontent they can create. In a sense, the Internet is the multimedia equivalent of the photocopier. It allows material to be duplicated at low cost, no matter the size of the audience. Bill Gates created a dedicated team with the sole purpose of bringing TV on the internet. However, that didn’t work, and soon enough a new company took it all. It was a startup created by two PhDs at Stanford, it was called Google, and it would quickly become a hit. However, Google didn’t try to bring TV on the internet, quite the opposite. Google got founded on a most straightforward yet more powerful (at the time) concept: search. By inserting a simple word or combination of words within a box, you could get millions of results, quite fast. And the first of those results had good chances of being relevant for what you were looking for, that’s it! That was Google innovation; as Microsoft was already looking at bringing the logic of TV to the web. Google instead focused on indexing all the web pages it could and rank them based on a relevance system, which followed the PageRank algorithm. At that time it was innovative enough, yet also practical enough to allow Google to scale up, quite fast. Trying to bring video content on the web, might have been too ambitious and probably impossible, considering the existing physical infrastructures. Yet the internet was ready to evolve as a text-based web! Today something new is finally happening. As AI and machine learning capabilities expand, and the current web infrastructure has become able to handle video content, the web has finally become video-based compared to the past. That’s why companies like YouTube have become so popular! Today other companies are taking advantage of Google’s weaknesses to build a business model. Take the DuckDuckGo business model. 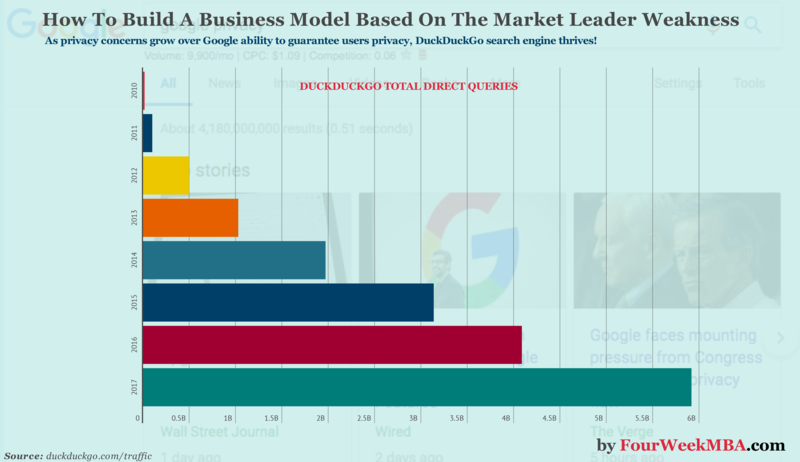 As privacy concerns over Google grow, DuckDuckGo gains traction. Its growth is continuing year over year! Why might a value proposition based on a market leader weakness be so compelling and useful to build a business model? For a few simple reasons. Google today is a company that still generates most of its revenues from advertising. Therefore, the mechanism behind Google financial success is based on its ability to keep producing as much money from its advertising network, while reinvesting that money in other growth areas. In short, a market leader is usually a large conglomerate, and also if it maintained an agile decision-making organizational structure, it’s still quite slow compared to a startup. That connects to the second point. When you’ve managed to put together all the pieces of the puzzles, and all the moving parts of the value chain that is when a business model is born. While any organization keeps experimenting and evolving its business model, large companies like Google cannot afford to experiment too aggressively with their business models as the risk of breaking the company value chain apart is too high. In this context, as a new player, you’re in the opposite situation. Not only you can afford to experiment with the different types of business models. Experimentation is the key to survival and to thrive in an industry dominated by someone else. The market leader might not see it coming! In other cases yet the market leader might not see it coming! For instance, Google knows how privacy is critical for users. That is also why it shut down its operations of Google+. However, in most cases, the dominant player might not see it coming! Why then – if Google realized the importance of privacy – it’s not changing the way it works? If Google were to change its workings to guarantee privacy (just like DuckDuckGo does) that would kill its business model, built on data itself. Indeed, data is what makes Google the tech giant it is today! In this context, you can create a value chain by starting from the market leader biggest weakness! Are you starting from scratch in designing your business model? Below the resources to build a business model from scratch! What are the primary components of a business model? How many types of business models exist? Is lean startup canvas for anyone? Is it better to use the business model canvas or the lean startup canvas? Next Next post: As Google And Facebook Lock-In, Publishers Get Kicked Out!